KERCH, November 26. /TASS/. 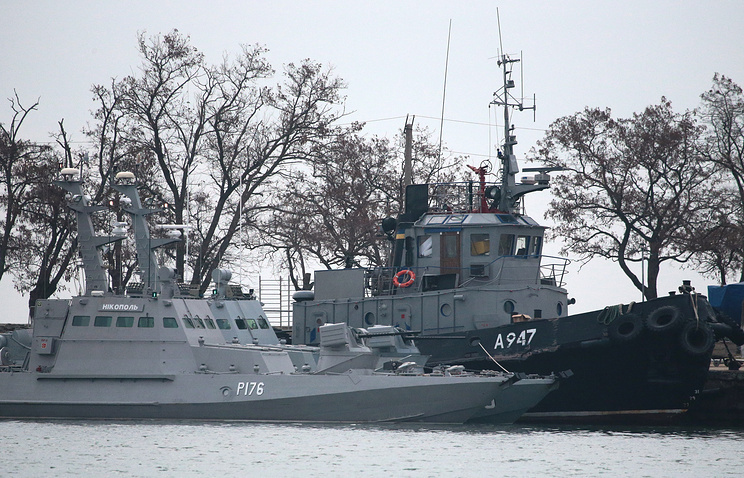 Three Ukrainian navy vessels - two armored artillery ships and a tug boat - detained for illegally crossing Russia’s border on Sunday, remain in the port of Kerch, a TASS correspondent reported. The vessels have been covered with a camouflage net. Except for a small impairment on the right side of the Yany Kapu tug boat, there are no signs of damage. According to the Russian Federal Security Service (FSB), on Sunday morning, three ships from the Ukrainian Navy - the Berdyansk, the Nikopol and the Yany Kapu - illegally crossed Russia’s border and tried to carry out some illegal manuevers in Russian territorial waters on Sunday night. They ignored valid demands to stop issued by vessels belonging to the FSB Border Service and the Black Sea Fleet and continued maneuvering dangerously. In order to stop the Ukrainian ships under pursuit, gunfire had to be used. The three vessels were detained in Russia’s territorial waters. Three Ukrainian military servicemen suffered light wounds and were given medical assistance.